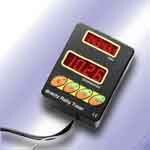 Brantz offer a complete range of additional units, specially designed to compliment our tripmeters. Historic Rallying Events? Average Speed? Set this machine to the speed you wish to average (with accuracy to one decimal point) and it will keep you constantly informed with exactly how far you should have travelled. The Marshalling clock features hours, minutes, seconds and hundredths of a second, spread over two uses of a large format four digit LCD screen. The primary function of a Marshalling clock is to hold the time of day for logging purposes when a competitor completes a competition stage, then restore the current time of day to the readouts following the noting of the competitor's time. A bonus feature is that this clock holds a memory of the previous frozen time, just in case the competitor's time is lost before the time is noted or agreed. Accurate speed measurements from BRANTZ. PLEASE NOTE: The speedometer is not currently available due to a World shortage of the special chips used. Check if you can wait. The three digit speedometer can be added onto the International series of tripmeters and has it's own front entry digital calibration controls for mph or Km/h. The unit connects to the Brantz via a simple three-wire connector and can be mounted in the car to benefit either the driver or the co-driver. N.B. Prevent Vibration! 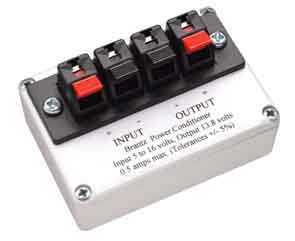 - Excessive vibration can cause one counter to disagree with the other. Remember that the counter technology of the Retrotrip is necessarily over fifty years old and today's expectation of perfect performance is a little harder to achieve. Older cars with 6 volt electrics or less reliably performing 12V charger systems should use a Brantz Power Conditioner which will always produce a correct voltage source for Retrotrip.